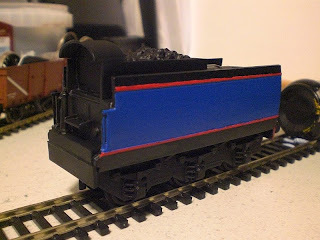 THE BRITISH RAILWAY STORIES LTD: "One more project...!" Strange looking thing isn't it? Definitely not from the Eastern region. This is a Bullied Tender for a "Battle of Britain" Dapol kit I picked up cheaply - I am building it for a friend on his instructions. It will have several modifications from the real-life prototype. Again, I have mixed the paints for it up myself - I find that really rewarding and relaxing in this hobby. The shade of blue I call "NWR Purple" - as in different lights it looks more purple coloured. The red is from the Gamesworkshops range ("Blood Red") and needs to be a lot neater!!! Wait until you see what I've done to the engine, though...!